Accu Clear Pregnancy Test is another pregnancy test I would recommend taking as close to your expected missed period as possible. 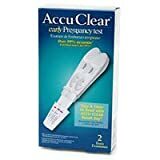 Like other pregnancy tests, the Accu Clear Pregnancy Test could possibly show false negatives if you are too far away from your expected missed period. Some of the pros of the Accu Clear Pregnancy Test are that it has a wider stick than most pregnancy tests, which does make it easier for you to use, and it seems to be very accurate within a day or two of your missed period. One of the important cons that I have found is that the Accu Clear Pregnancy Test seems to have a deeper results window which could cause shadows when you are trying to view your results. Some people might have problems indicating whether they have a positive or negative reading because of this shadow.